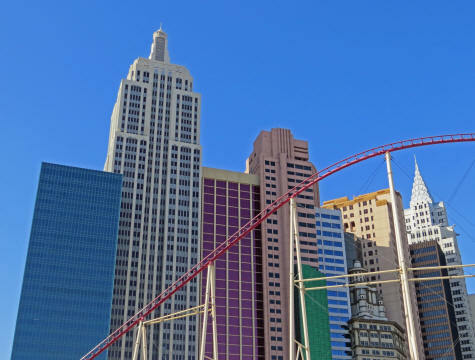 The New York - New York Hotel Casino is a massive resort facility located on the Vegas Strip in Las Vegas USA. The complex is comprised of multiple towers, each resembling famous New York City skyscrapers such as the Empire State building and Chrysler Building. A replica of the Statue of Liberty and Grand Central Terminal can also be found on the premises. A giant roller coaster runs through and around the entertainment complex. There is also a large entertainment venue that is home to Cirque du Soleil's "Zumanity" production. The New York - New York Hotel Casino is located on the Vegas Strip at the intersection of Las Vegas Boulevard and Tropicana Avenue in Las Vegas USA.